Seafood | Who's Cooking for Kacey? Hooray! It’s Restaurant Week in Dallas! A time when top notch restaurants flaunt their stuff and lure you in to their establishment with promises of three course meals all for the low, low price of $35 per person. If you don’t believe me, check out the regularly priced menu and you’ll see what a spectacular deal this week is! First stop, Abacus. My foodie father-in-law has mentioned his fondness for this establishment, and this alone was enough to land this restaurant at the top of my Restaurant Week to-do list. Thanks to the goddess of Restaurant Week, my sister Kristin (#3), restaurants were chosen and reservations were made and I did not have to lift a finger. A producer’s life never stops. Kristin (#3) can do it all commercials, video games, even coordinate Restaurant Week reservations for her siblings…which I’m sure she’d tell you is the most difficult job by far (we can be difficult to manage). 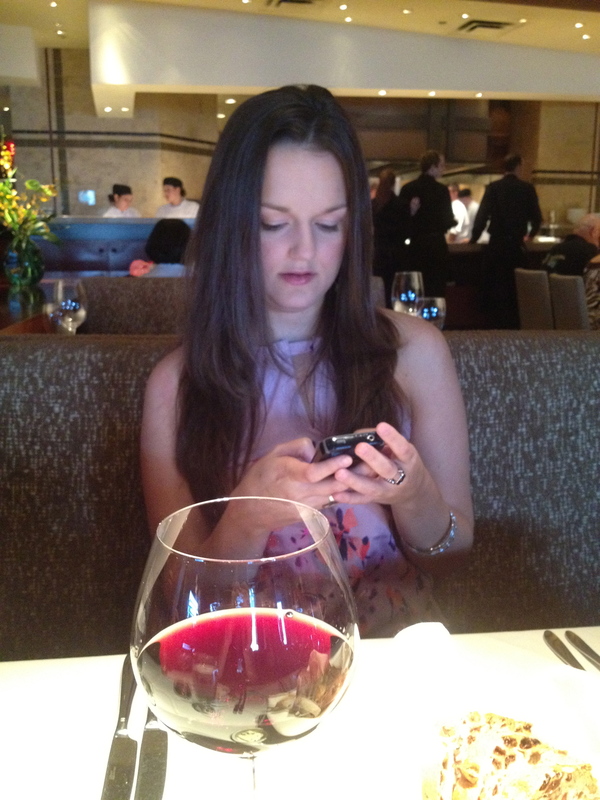 What’s a girl to do when she arrives 30 minutes earlier than her reservation? I didn’t eat the wasabi peas. I thought about it and I was almost positive they put out the tiny container just for me when I took a seat. Then I thought about all the TV shows I’ve seen in the past where patrons were heckled for eating the “scary bar nuts” and I just decided to pass. 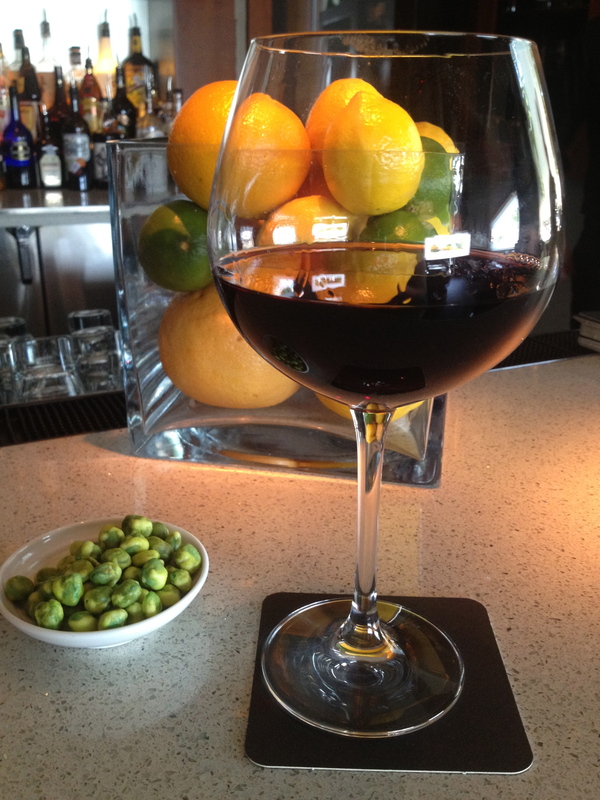 Nope, I didn’t mind a little down time while waiting for my two fabulous sisters to arrive. Kandace (#2) and a nice glimpse of the restaurant. Each restaurant that participates in Restaurant Week has their own special “take” on it. 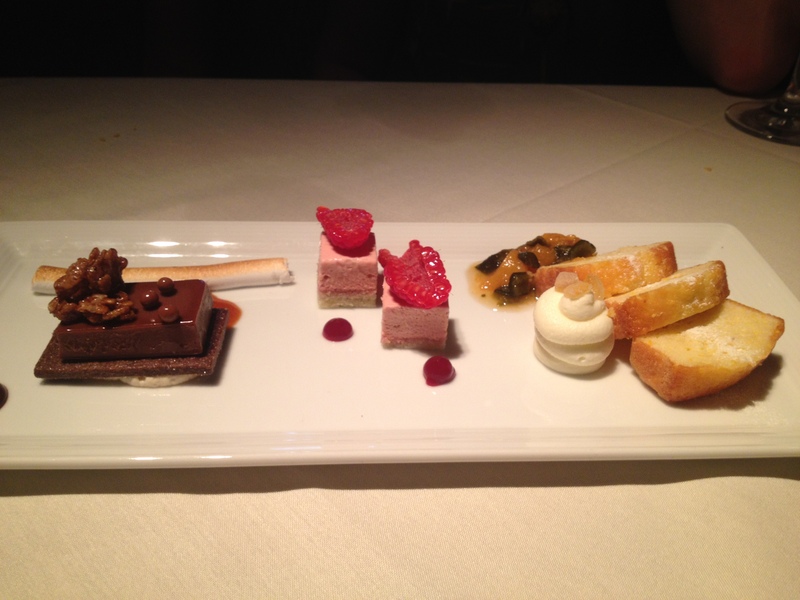 At Abacus, we were to choose one small plate, one big plate, and then share a dessert sampler. Figuring out what to order so we all get a taste, takes a little discussion and negotiating. For instance, Kandace and Kristin are happy with eating half their plate and then switching plates with each other to finish it off. Me, on the other hand, well I really don’t like the idea of my plate disappearing. No big deal to those two, they were happy to take a bite of mine and move on. I much prefer the “share a bite” over the “split-an-entree-in-half” option. For small plates, we chose the (1) Pimenton Seared Scallop with Spanish Chorizo, Okra, Texas Tomatoes and Sweet Corn Cream, (2) Crispy Roasted Duck with Garlic White-Anchovy Gnocchi, and the (3) Arborio Rice Crusted Rock Shrimp in a Citrus-Fresno Syrup. The freshest dish was most definitely the Pimenton Seared Scallop. It’s hard to get fresher than okra and tomatoes in Texas. My duck and gnocchi small plate had a nice blend of flavors and just enough to gnocchi to both keep you satisfied and wanting more at the same time. I could have downed a big plate of this dish in no time. There was just enough sauce not to dry out the duck; however, it is not my favorite duck dish thus far (if you’re interested, that honor is reserved for Sangria’s). Choosing our big plate entrees was less complicated. Steak and Shrimp. Kristin and Kandace split both thanks to their handy little pass off system. I got to eat my entire steak plate, plus a bite of Kristin’s amazing Pan Seared Gulf Shrimp and Roasted Poblano-Cilantro Grits. The shrimp and grits completely reminded me of a casserole and so of course, I was in awe. There was a mix of poblano and cilantro with a nice sweet pop of corn. 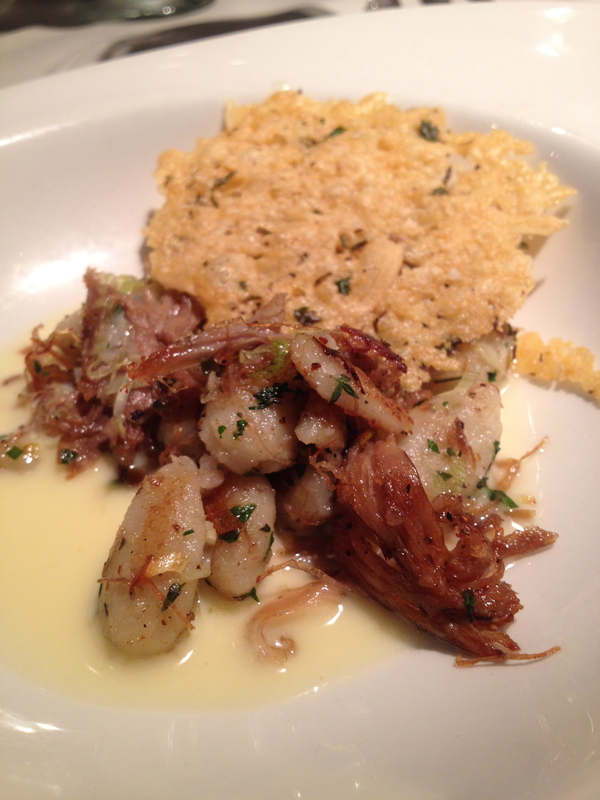 Here’s a bit of extra good news…these grits are standard dinner fare for the restaurant. 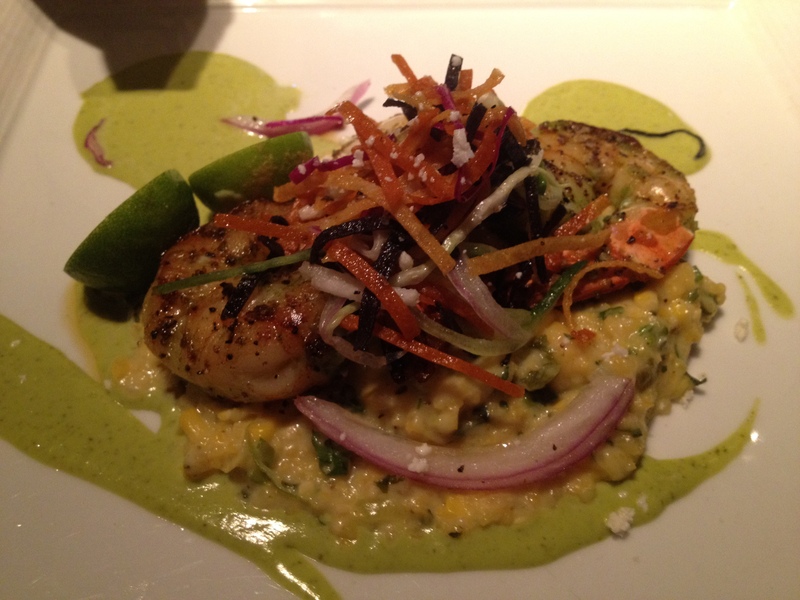 If you don’t have Restaurant Week reservations…no worries, you can taste these tasty grits anytime! If you have never tried grits, I’d recommend starting here. 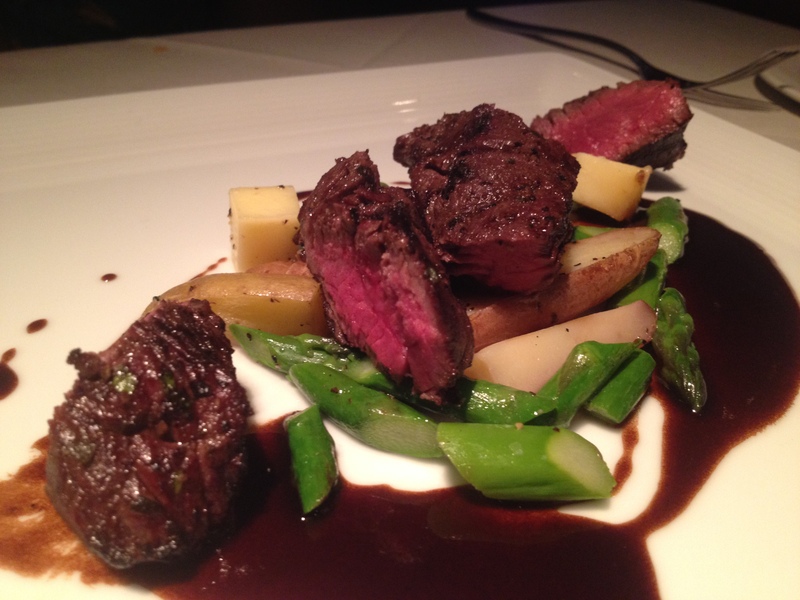 The Hickory Grilled Kobe Hanger Steak was cooked to absolute perfection! At first glance, I could tell Kandace was rethinking her “medium” request. The steak was way more pink than I’m typically comfortable with too, but (and I’m not quite sure how they do it—actually, everything in the kitchen, as you know, is a mystery to me) it was cooked completely through and perfectly tender. I’m talking every bite went down smooth, no leftover bits or fat or anything. Bravo. If this is what they can do with hanger steak, I can only imagine the heavenly beef that awaits you in their Niman Ranch bone-in filet mignon (now this is a farm-fresh item I’m happy to see on the menu), ribeye, and Kansas City strip that is on their regular menu. Skip the fingerling potatoes, though. Nothing special there as they were a little overdone. The steak, asparagus, and farmer’s cheese were so good you could definitely overlook the potatoes. Dessert was served up in miniature portions that were perfect for sampling: Brazos Valley Yellow Grits and Lemon Poundcake in Texas Peach and Roasted Poblano Jam (Kandace was a fan of the jam; however the poundcake was a little grainy, guess that’s from the grits), Frozen Raspberry Parfait (it was discovered that us girls are not a big raspberry fan, so now we know it may be an inherited trait), and the best thing was the Burundi Coffee Ganache, Mocha Sable, and Cocoa Caramel Rice Crispies. What makes this dining experience even better is the fact that at today’s meal at Abacus, I was able to feed 21 people with the purchase of my one meal! The three of us feed 63 people (you know, with the help of the North Texas Food Bank)! Oh yes, finally eating and doing “God’s work” is synonymous. Charity work has never tasted so delicious. But what I got, and I kid you not, is 4 (yes, 4) regular size shrimp with a cocktail sauce river running through it. Even the $7.95 price tag could not explain this. 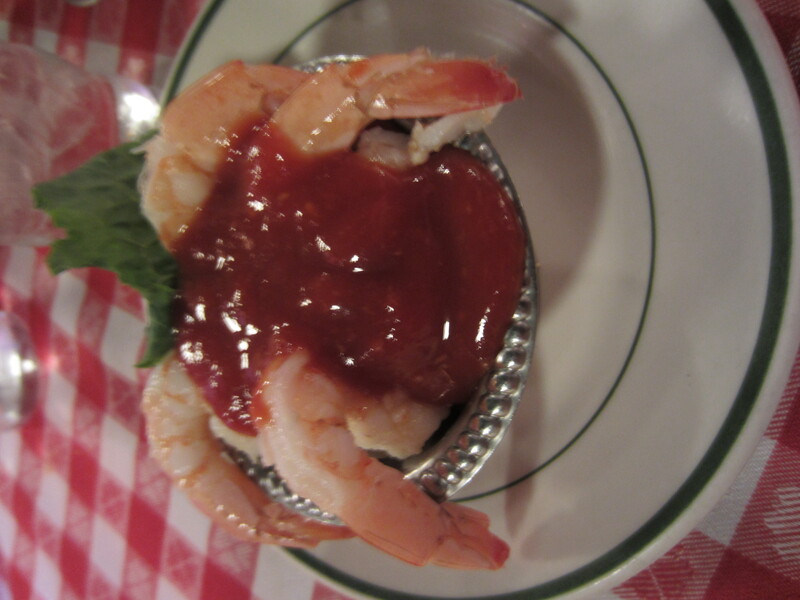 I truly thought I was in for a shrimp cocktail, not 4 shrimp covered in red sauce. Now this is just sad. It was so sad that Danny felt the need to give me a little of his meal and it made it less sad, but still sad, just the same. If your shrimp cocktail greatly differs from the traditional standard, I do feel like customers need an ample warning. The menu should totally disclose that you are serving up an impostor. At the very least, the server could have given me a heads up when this was the only thing I ordered. 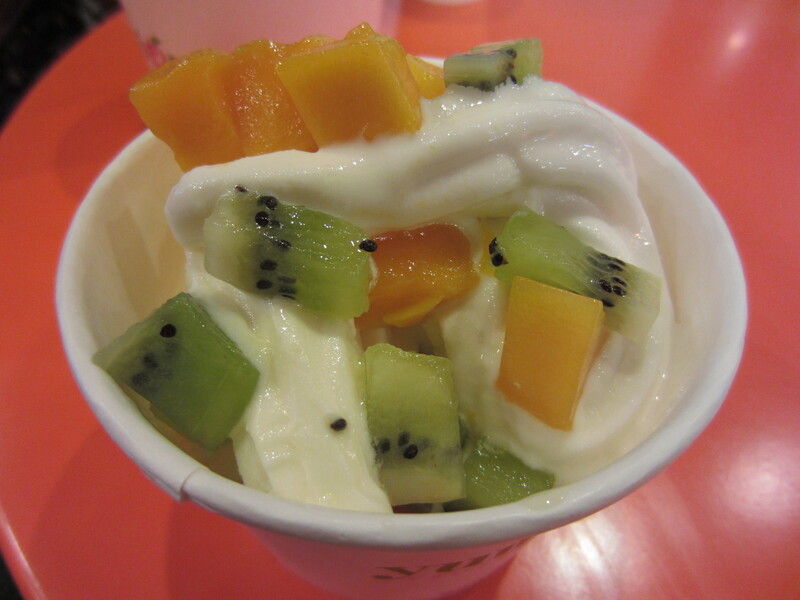 Needless to say dinner had an encore of frozen yogurt (Mango Tart with fresh mangos and kiwi) and pizza and I was SAVED! 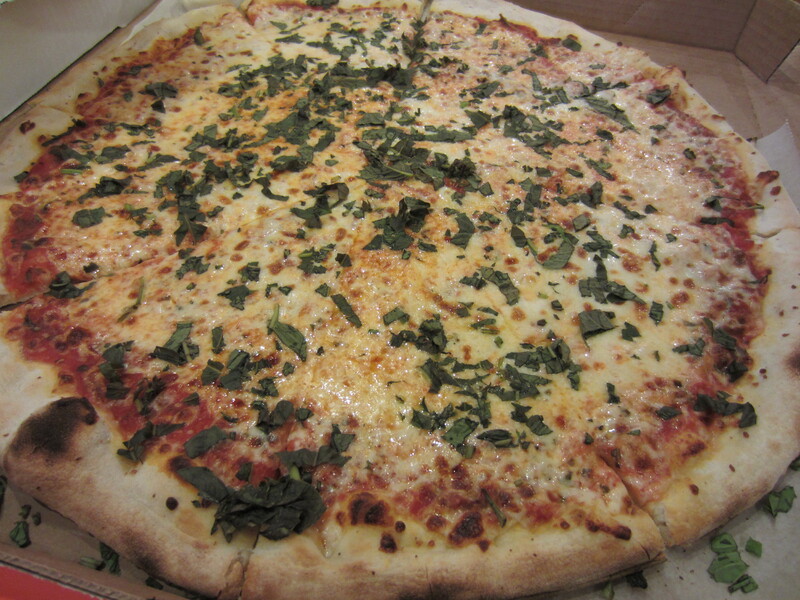 Margherita Pizza (no tomatoes in sight though….can that still be considered “Margherita”?). This pizza was from a place next to Yumi-licious in Uptown. While I was busy making my yogurt next door, Danny snuck over to order a gigantic pizza. Guess I wasn’t the only one that was still hungry? I’m just thankful he took pity on me and shared his 1st dinner of the evening. Now that’s love. Where Not to Go for a Shrimp Cocktail: S & D Oyster Bar! However, to be fair, their entrees are quite good and so is their service. 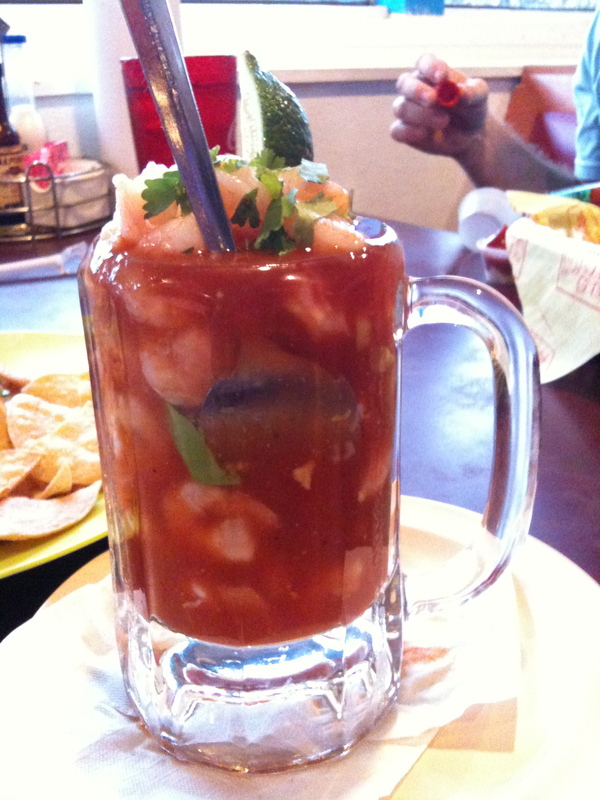 Try Big Shucks shrimp cocktail instead as they do not disappoint. Bonus Tip: Take a Trolley Ride around Uptown, they stop right next to Yumi-licious. I’ll let you in on an internal conflict I have as a food blogger. 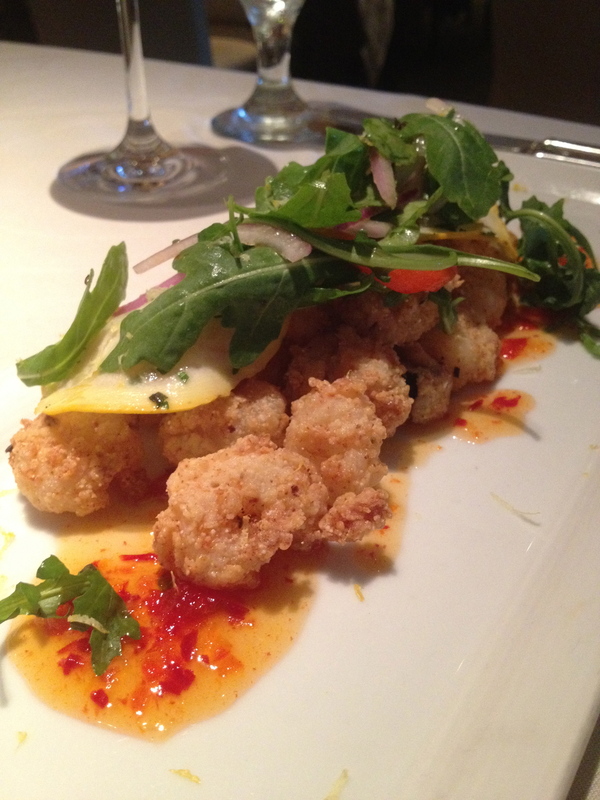 Do I try a new restaurant for blogging’s sake or do I go to an old, trusty favorite for a repeat meal? It can be a bit anguishing if you ask me. Sometimes a girl is just a hungry mouth and wants something guaranteed to be delicious. So while on vacation at St. Pete Beach, Florida, we decided to find a few new “favorites” and then eat the crap out of them. Afterall, we would only be there a short time; therefore, it was no time for culinary mistakes! 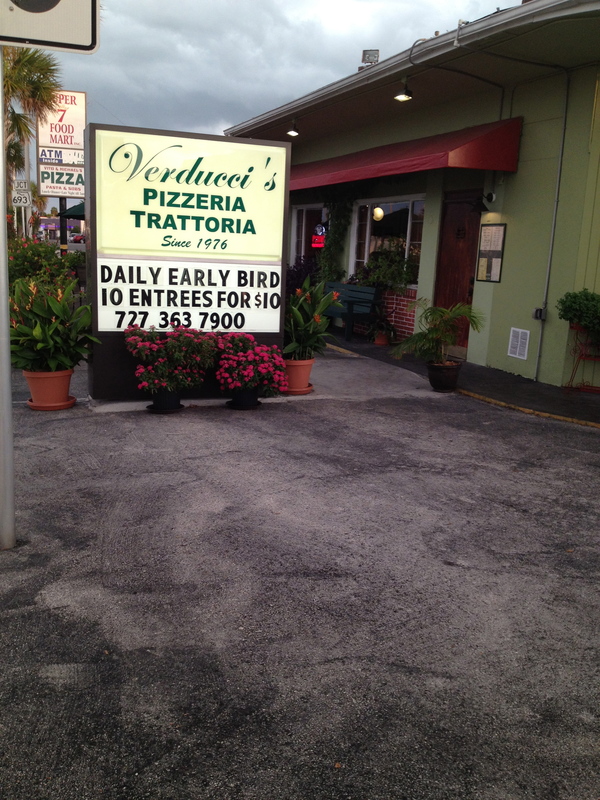 There were two restaurants on repeat….the first being Verducci’s Pizzeria Trattoria as I’ve mentioned previously and the second was Dockside Dave’s to get our casual seafood restaurant fix. Rated #21 of 89 restaurants in St. Pete Beach on Trip Advisor, we were confident that Dockside Dave’s was far enough up on the list to be a good choice. As Danny and I drove around trying to find a casual meal our first night there, I remembered the name of this restaurant from my brief moments of research. It was 9:00 p.m. and places would be closing soon (St. Pete Beach is more of a family destination so most things are closed by 10:00 p.m. just FYI) so we knew we had to choose fast. When we walked in and saw this baby, I knew we had chosen correctly. 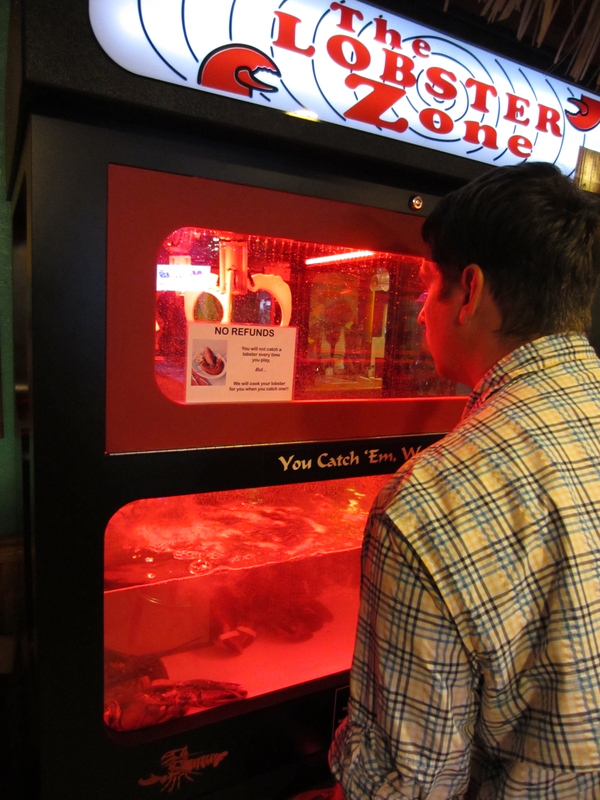 Danny is mesmerized in front of the live Lobster Crane Game. Danny is an absolute sucker for games in which you have a joystick and try and get the crane to drop down and gather up a plush toy or candy without dropping it. He is actually quite good at it. In fact, I’ve never witnessed someone win as many crane toys. When we were dating, he mentioned that this was a talent of his and I didn’t quite believe it until he proved it to me time and time again. 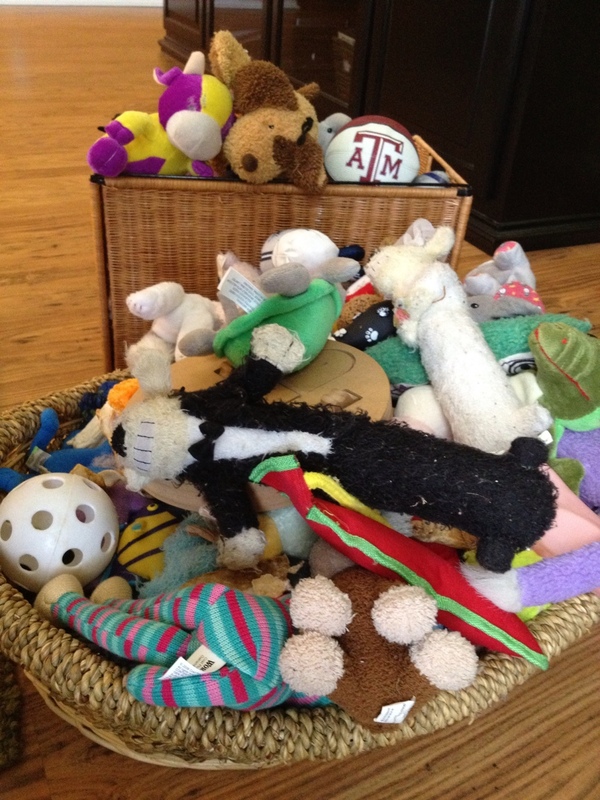 Our dog Daisy has not one, but two toy baskets and a big reason behind this is that Danny is quite good at battling the crane and winning. 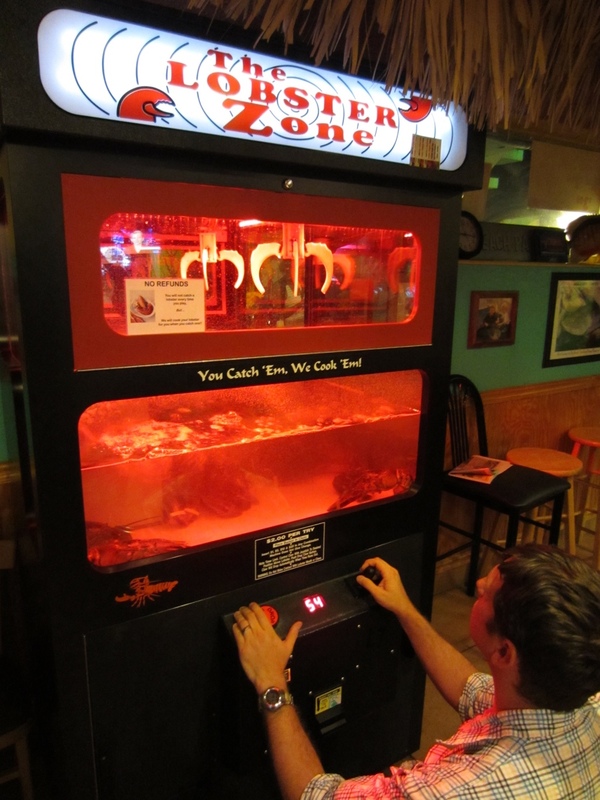 So a crane game in which you spend $2 for a chance to grab a live lobster and win your dinner…well, he was in game heaven! He will tell you that winning a game in which a dormant object is involved is a lot easier than one in which your target moves, even after it was securely in the crane. Needless to say, a $2 lobster dinner was not in store for us; however someone did “win” while we were there. I use “win” loosely because there is just something a little disturbing for animal lovers like myself to see a game of this sort. There is a bittersweetness to each “win” because ultimately the winning item “looses”. Sure I eat meat, but I’d rather not see the guy alive and well minutes before I chow down. I, for one, need more distance than that. Remember, this restaurant was on repeat so I’m going to mention all of the food at once, without separating it out by day. Know that two people cannot eat all of this food in one sitting, even die-hard eaters like Danny and I. The Captain’s Plater was a generous helping of country fried grouper (this is the fish this place is known for! 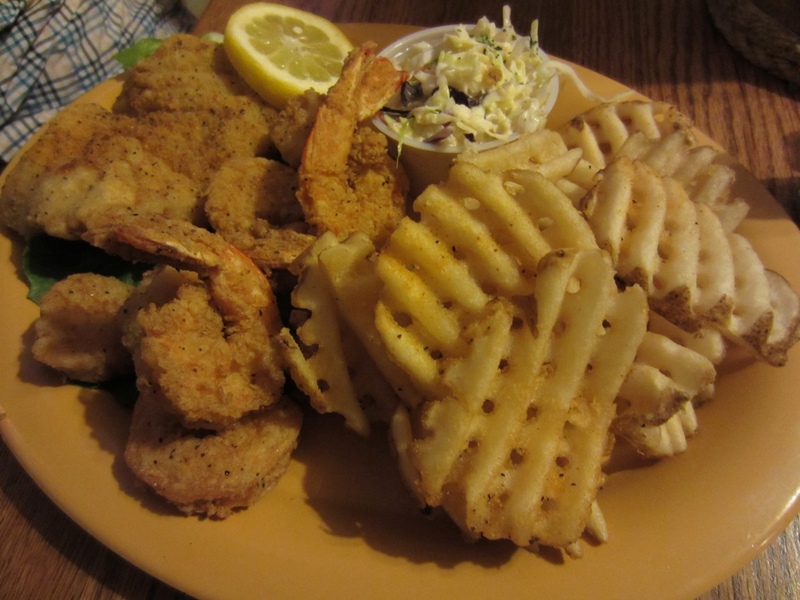 ), shrimp, and scallops served with waffle fries and cole slaw. The grouper and scallops were particularly scrumptious. I couldn’t believe fried scallops could be so crunchy and salty on the outside while maintaining their sweet and tender consistency. The waffle fries were also some of the better ones we tasted. I heard other customers discussing their tacos amongst themselves and I decided to give the blackened grouper version a try. Large flour tortillas engulfed a super generous filet of blackened grouper, guacamole, fresh salsa, cilantro sour cream, and shredded cabbage. 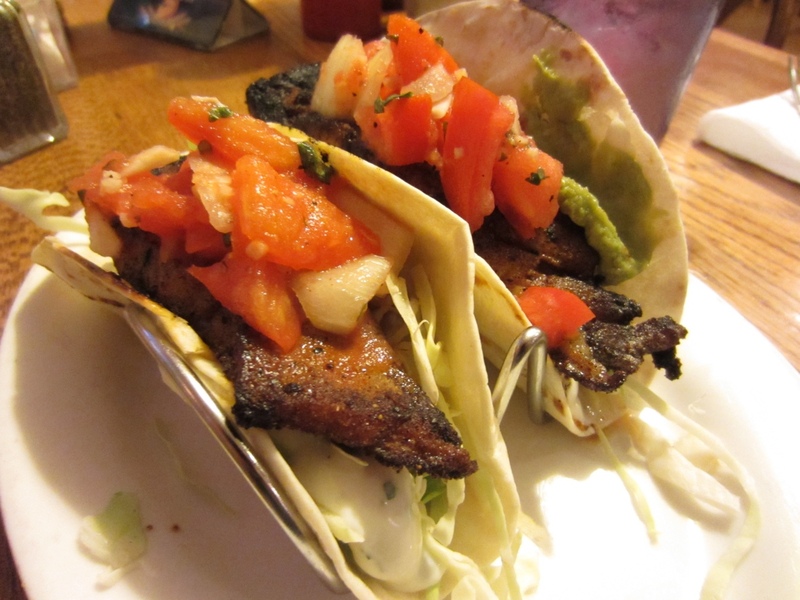 I enjoyed the tacos so much that while at the Madeira Beach location, I expressed how good they were and the no-nonsense, cool as a cucumber waitress served them up as our free appetizer! Ok, I skipped a part. You see, I missed all the drama, but while I was away from the table, apparently a customer freaked out when his tacos did not come with an abundance of cilantro. The waitress pointed out that the menu said it included “cilantro sour cream” and he went bizerk screaming that he had shrimp tacos all across the U.S. and they ALL came with cilantro. Needless to say, he stormed out and boy did he make a bad choice there (but if this is any indication, I’m sure he is quite used to making bad choices). 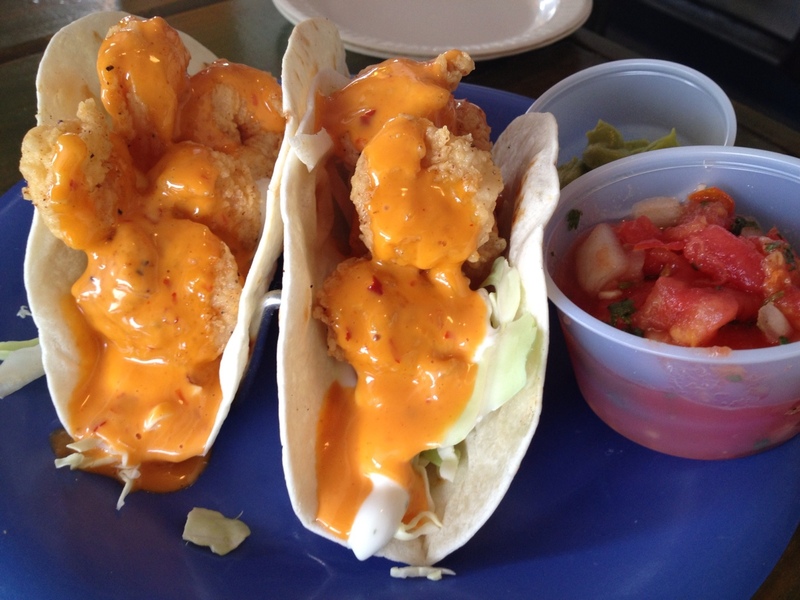 The spicy shrimp tacos were amazing (even better than the blackened grouper ones I paid for), and no cilantro is necessary, FYI! Thanks screaming patron; they were delicious. Monday through Thursday from 3:30 -5:30 is the early bird special. 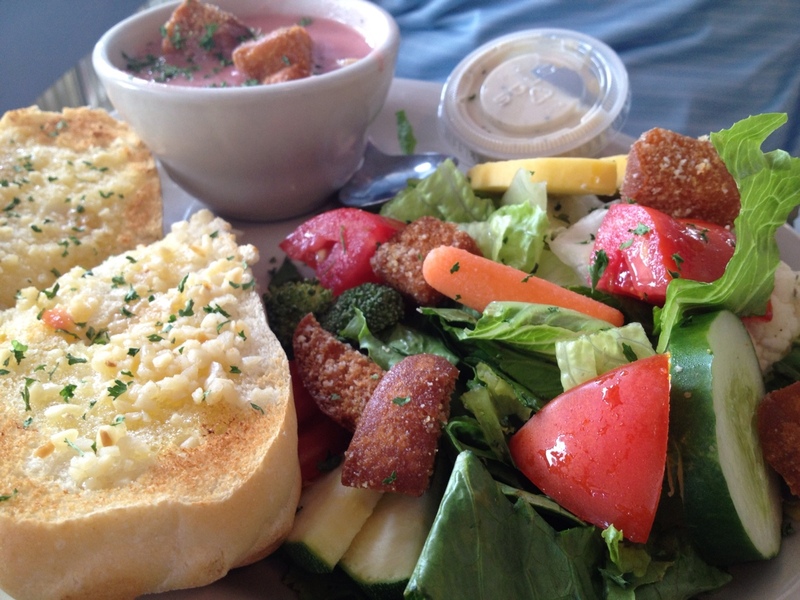 We chose the soup of the day (, salad, and garlic toast for $5.95 and the crab cake sandwich for $6.95 which was served on a soft roll with waffle fries and cole slaw. Absolutely a fantastic deal! There were tons of different vegetables in the salad and the seafood soup (although oddly pink) is a solid choice. Although the crab patty appeared that it was too small for the bun, this was not the case. Apparently they engineer it so that when smushed, the crab spreads out and covers the entire bun quite nicely. No bite was without crab. This sandwich just might beat a burger any day. The prices are reasonable at Dockside Dave’s so this is a great establishment to visit again and again. I’m always looking for restaurants I can go with swimsuit and coverup dress intact (while on vacation), and this is certainly acceptable here. A nice casual atmospheres with good food at good prices will always be a winner in my book. So come as you are, bring an appetite for seafood and a steady hand, and who knows, you may just “win” a lobster dinner! 3. 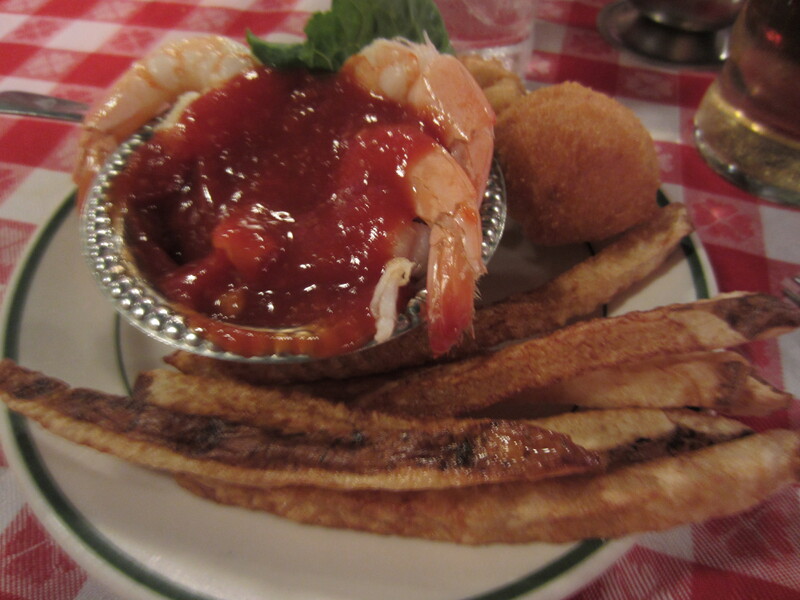 Captain’s Platter – amazing fried scallops and grouper! Or try something I have yet to (but will be coming back for) their World-Renowned 1/2 lb. 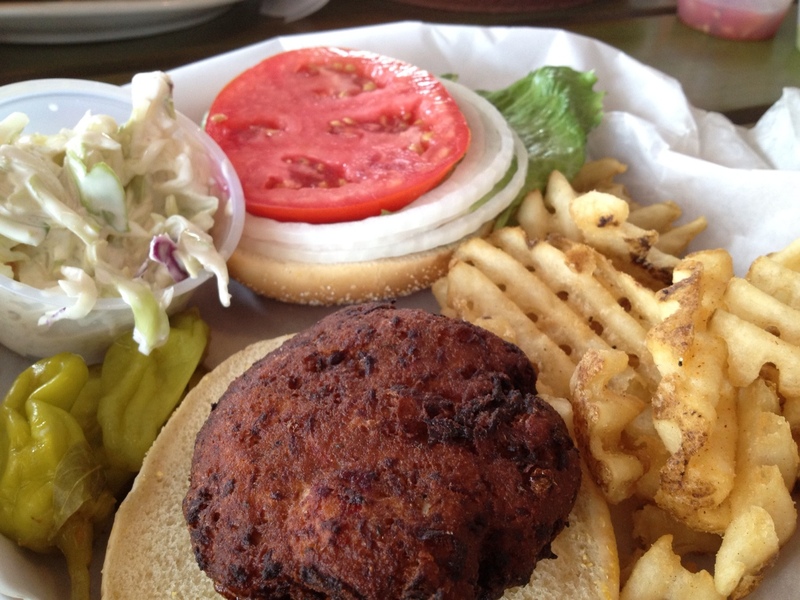 Fresh Grouper Sandwich. Let me know how it is, will you? I need to live vicariously. 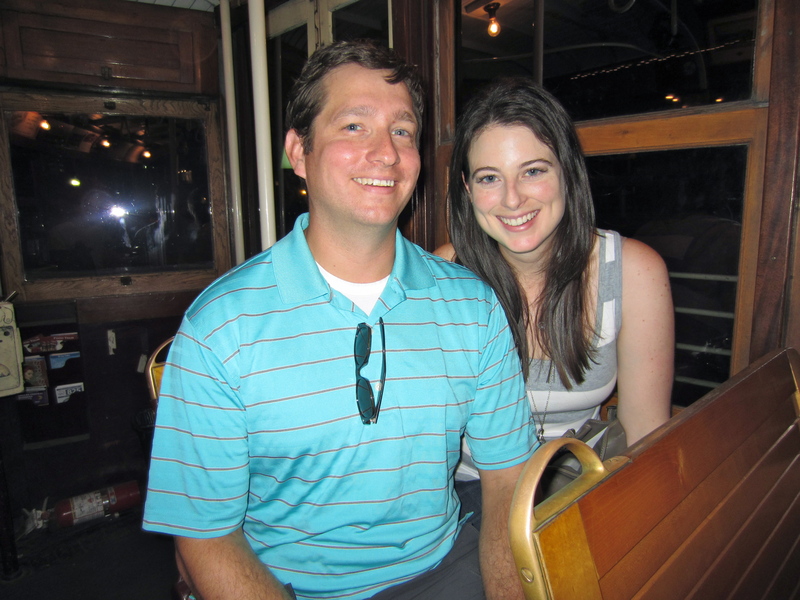 Florida Part I: What do Dolphins and Authentic Italian Food Have in Common? 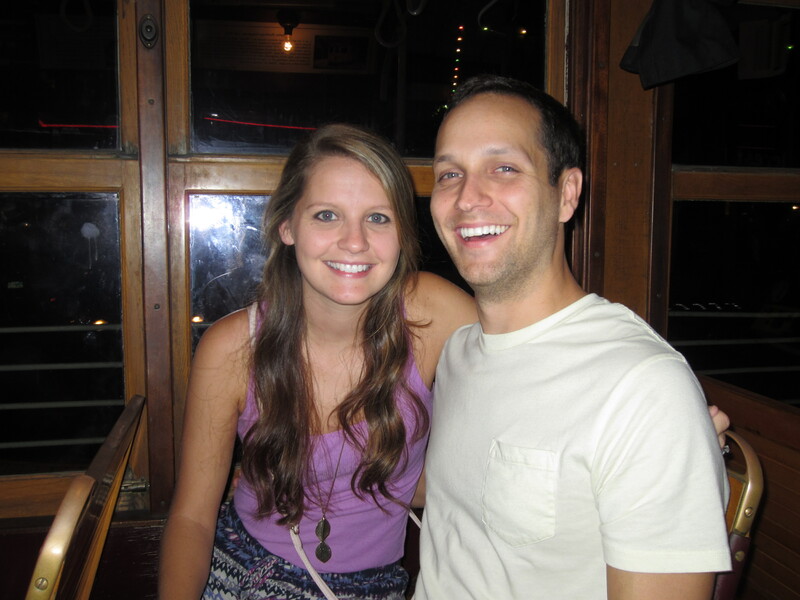 Spontaneous travel is definitely one of our “things.” Danny and I like to block out some time, throw around some possible destinations, and then book something anywhere from a few weeks to a few days before we leave. 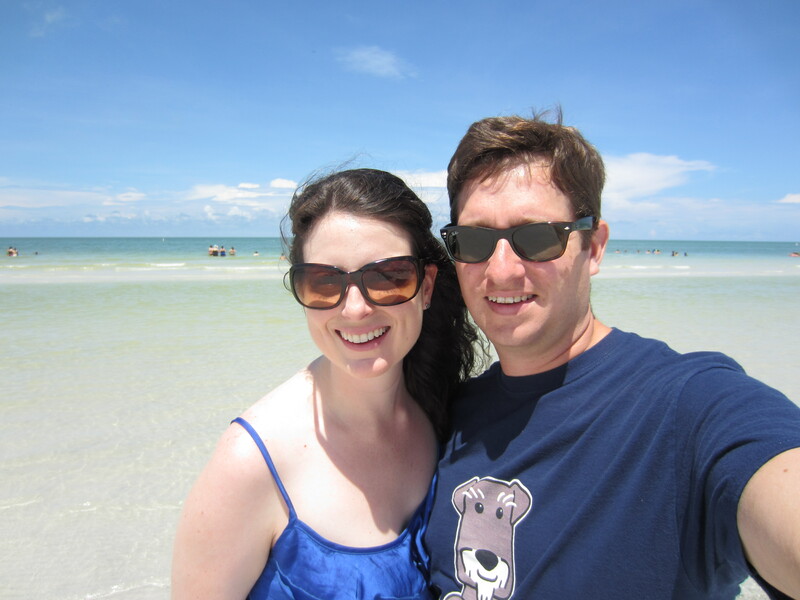 We talked about Aruba and Grand Caymen, but ultimately decided on Clearwater/St. Pete Beach, Florida. Staying in the States was important to us (for several reasons) and we enjoyed visiting both Hollywood and Destin last year, so Florida won out again this year. Wanting to still visit somewhere new, I immediately scanned through my long-term memory of places I’d said I’d like to visit and the Clearwater Marine Aquarium<;/flashed through my mind. This place may seem familiar if you saw the movie A Dolphin’s Tale with Ashely Judd and Harry Connick Jr. The movie is about a dolphin named Winter that lost her tail and the lengths that the aquarium took to help her thrive. 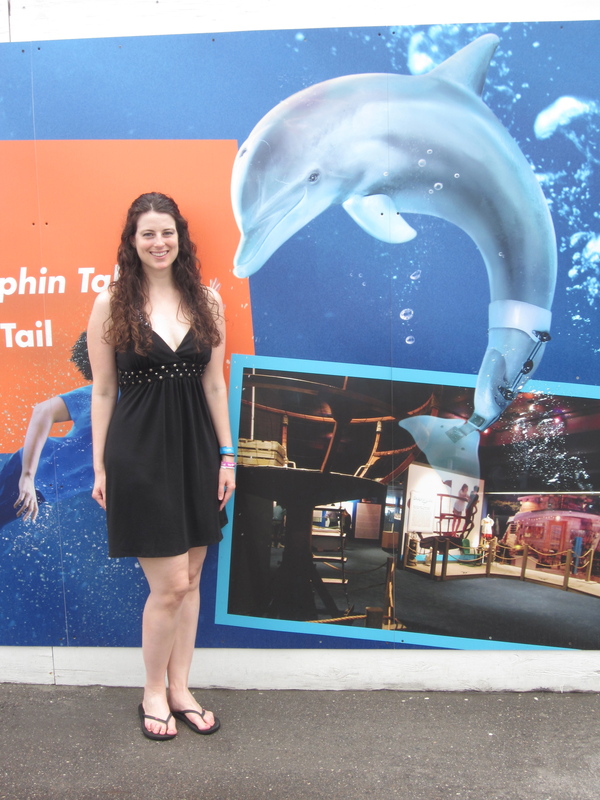 Clearwater Marine Aquarium from the movie A Dolphin’s Tale – It’s super humid here as you can tell by my crazy hair…by the end of the day I looked like Monica from Friends’ episode in Hawaii. I’m a sucker for animals in need and I like the idea of the underdog winning in the end. There is also something inspiring about the ability to overcome physical disabilities. If you are anywhere similar, then Clearwater, Florida may be a good vacation destination for you too. I like the idea of dolphins/wild animals being in captivity only when they need our help to survive. Dolphins are definitely awe inspiring, but I’ve also seen the Oscar Award winning documentary The Cove, and I prefer their well-being over satisfying my curiosity any day. St. Pete Beach, Florida proved to be a wonderful place to visit with tons of activities and several great restaurants to enjoy. 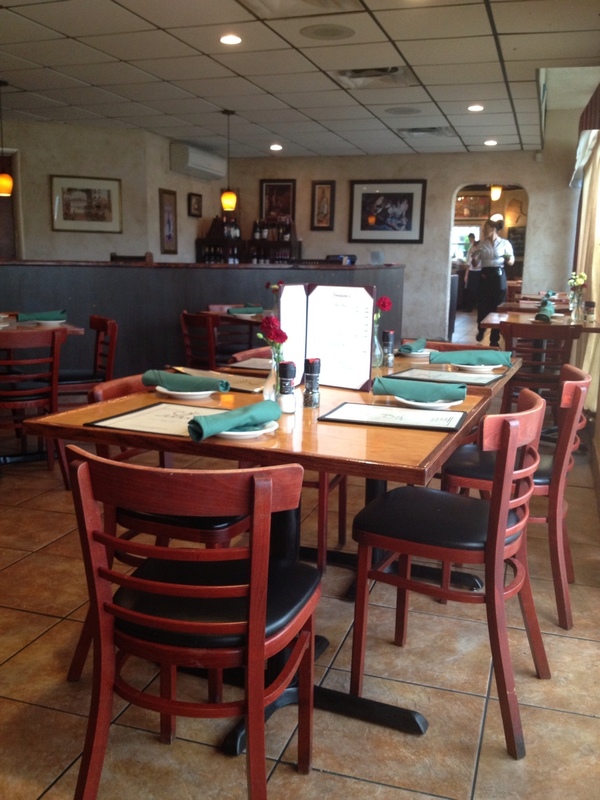 The best restaurant in the area is Verducci’s Pizzeria Trattoria. Here is a glimpse of the menu, as the restaurant does not have a website. TripAdvisor was completely accurate with this #1 rating. Verducci’s is owned by two Italians who take great pride in serving up the freshest, most spectacular Italian food I’ve tasted to date. It has been several weeks since dining there and I find myself still wishing that I could trade in my so-so restaurant pasta for any dish at Verducci’s. The server explained to us that their philosophy is really quite simple. In Italy, what distinguishes one Italian food place from another is the freshness of the ingredients they use. In order to stay at the top of your game, you have to bring in the best produce, meats, and cheeses several times a day….and this is exactly what Verducci’s does for us in the States and at great prices! We were able to spend about $60 on a dinner (drinks, appetizers, salads, entrees, and desserts) that in Dallas would be comparable for $120. All entree prices include a house or caesar salad and bread. This place is one of the few restaurants that gives Danny’s Kitchen a run for its money. Basically, this means that it is likely I’d choose Verducci’s over a meal at Danny’s Kitchen, and this is just not true of most anywhere else. I’m happy to share the highlights. Warning! 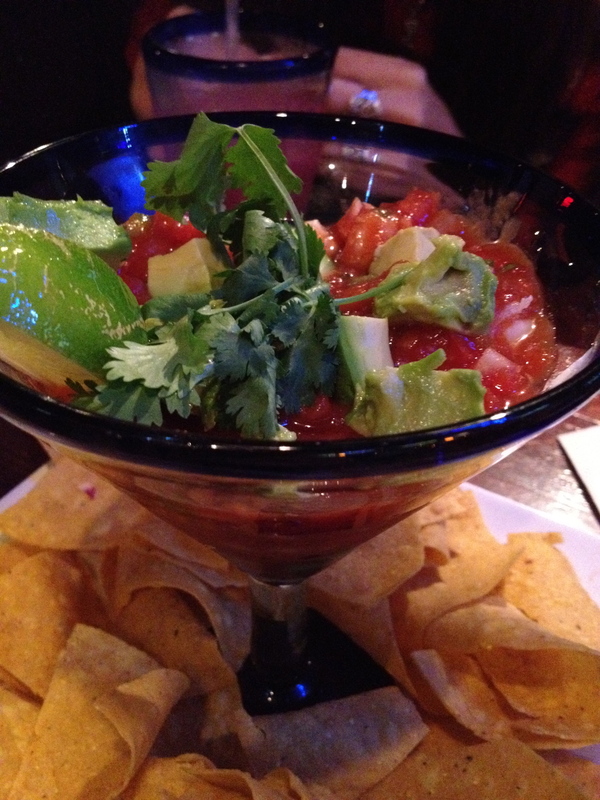 Your mouth will be watering. 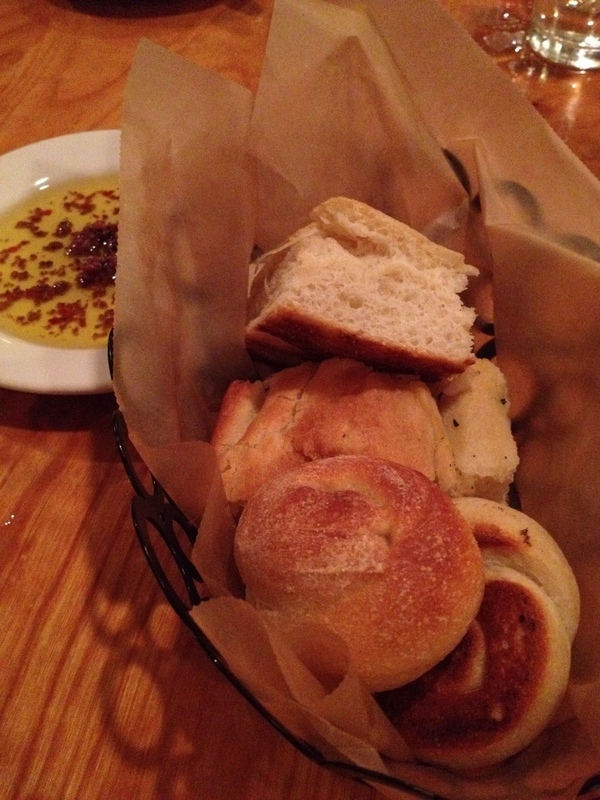 Let’s begin with the bread basket and olive oil. Oh my goodness have they nailed this! After running my bread through this plate, I will never be happy with run-of-the-mill olive oil dips again. Roasted red pepper, olives, and crushed red peppers all come together in a heavenly mix and are paired with focaccia and twist tie rolls (my favorite due to its light sweetness). 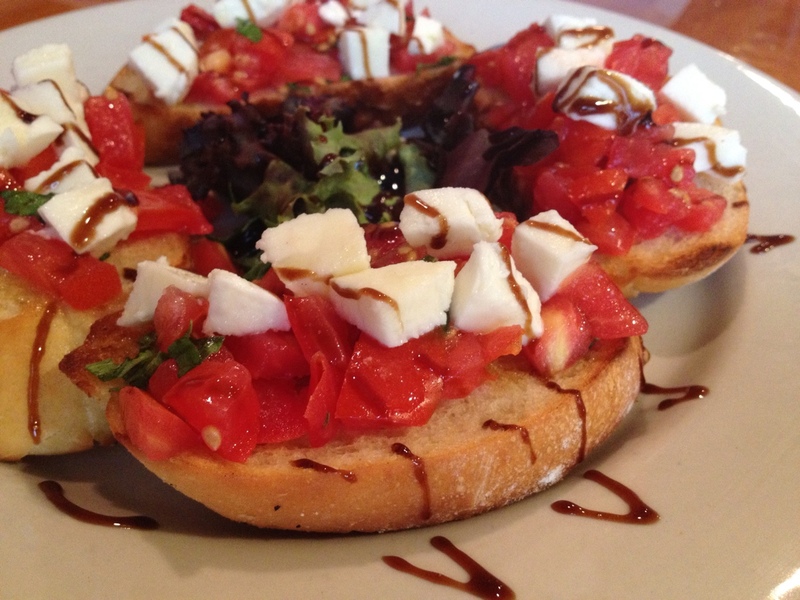 Here is the special bruschetta of the day that combined their typical bruschetta and the caprese salad. The texture of the crostini contributed to the appetizer being absolutely divine. Sure the tomatoes, basil (from their garden), and mozzarella were fresh, but the firm bite of bread into pillowy softness underneath made it unbeatable. 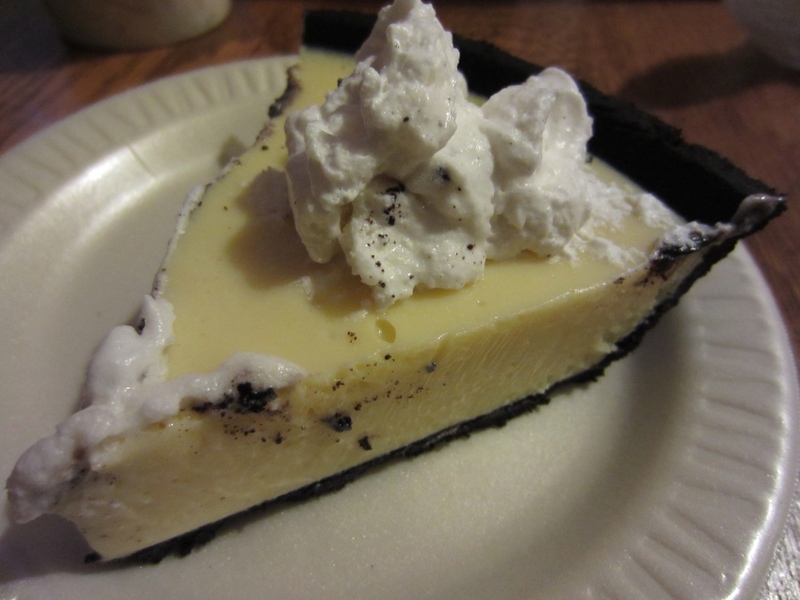 It had a texture that made you feel like you are accomplishing something when you bite in to it. 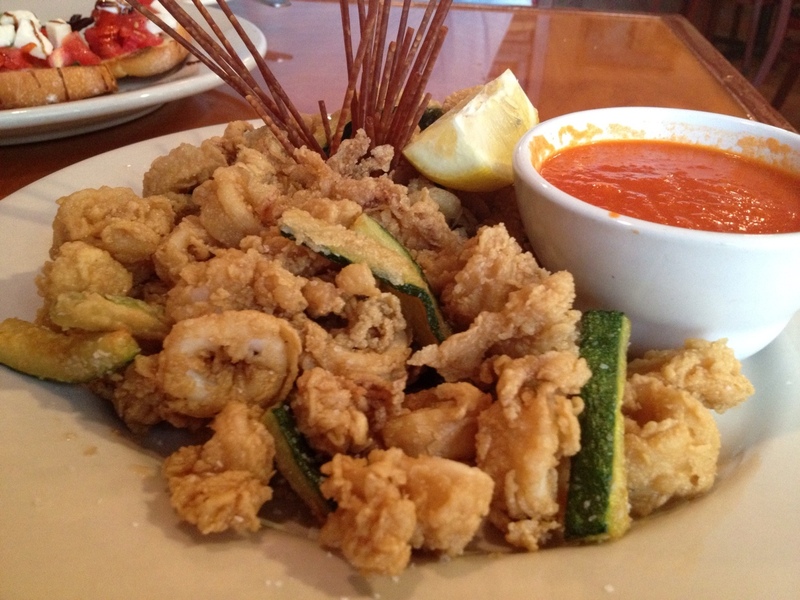 Calamari and Zuchinni: Be warned that they run out of this often. Get there early if you want to catch this delicacy before it’s gone. We missed out the first time we dined here. The zuchinni was a nice compliment and fared well in the made-from-scratch marinara dipping sauce. 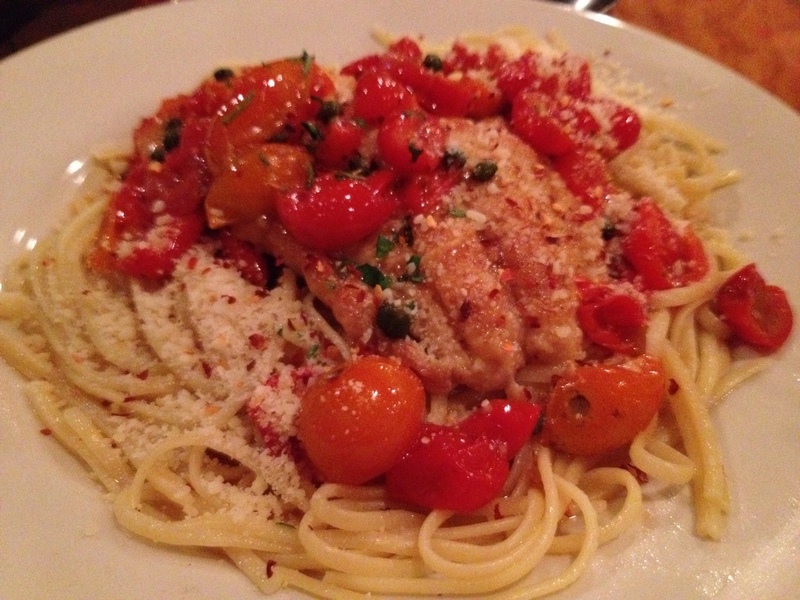 Danny’s absolute favorite meal was the Grouper Livornese, the very one that was written up in the New York Times! 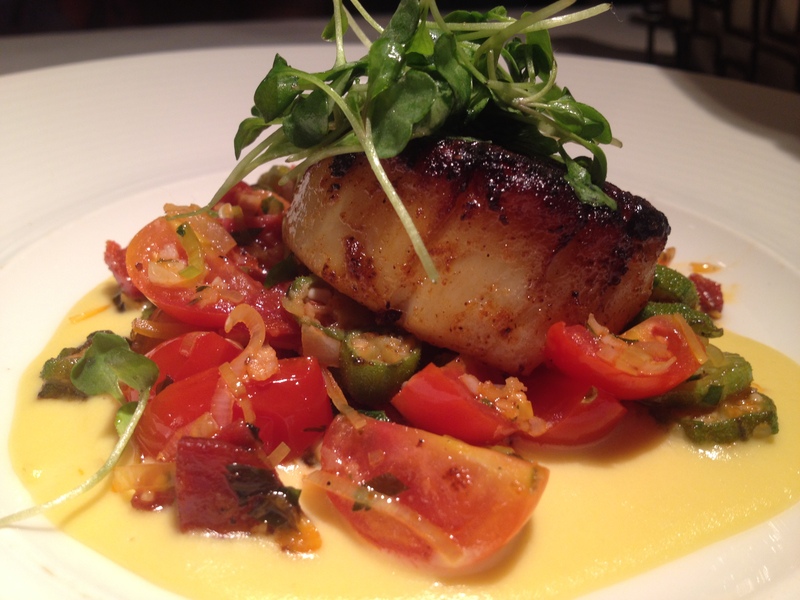 It is often a featured special and includes grouper, capers, and cherry tomatoes in a light sauce. He added red pepper flakes for kick and polished off every last morsel. Coming in second for Danny was the Sausage and Broccoli Rabe. For those of you not familiar with this entree…it contains no broccoli, rather a vegetable more like spinach. One night we made a stop at a fast food restaurant for a quick bite, only I didn’t order anything. 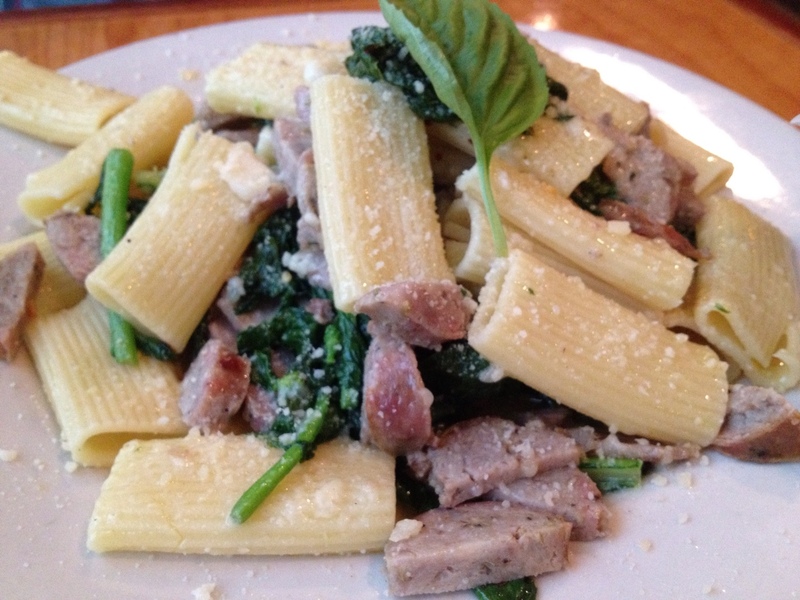 How could I when I knew that Danny’s Sausage Broccoli Rabe leftovers were calling my name?! My all-time favorite dish (we did eat here 3 times, so I feel like I’m qualified to say this) was the Shrimp Aurora special. 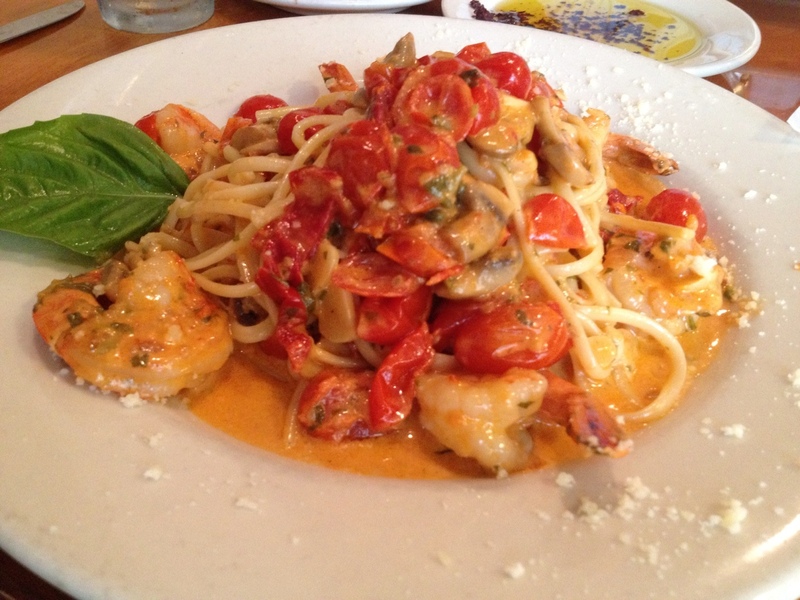 When I think of my perfect pasta dish…it does not come closer than super fresh shrimp in a pink brandy sauce with mushrooms, cherry and sundried tomatoes over linguine. It is like they GET me on a psychic culinary level! If you like pink vodka sauces, you will go NUTS for this. Honestly, this dish is worth the trip to St. Pete Beach. If I had a private plane, I’d be flying this dish in on a weekly basis or flying me to the dish (note to any of you with private planes who are looking for a new restaurant import…look no further). 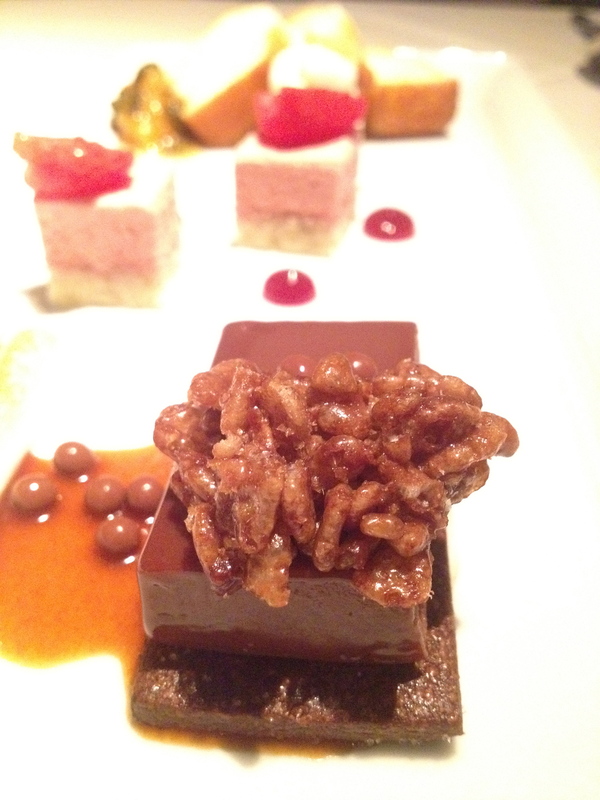 The desserts, though good, were not better than ice cream, which is my general measuring stick. I felt I needed to at least mention because you know my love for all things sugary, and vacationing brings about 2-3 times my usual intake. I did find the perfect dessert place and more on that later. 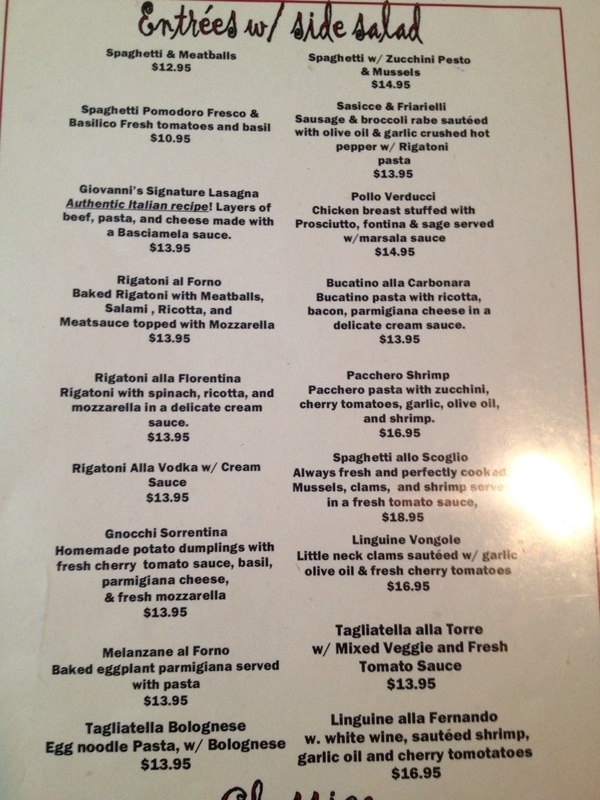 You cannot go wrong at Verducci’s! The owners make this nearly impossible due to the freshest ingredients and perfect blends of spices (Danny even mentioned that they use similar spice/herb combinations that he does, which is probably another reason we were in love with the place). It truly seemed like we were at home because they take pride in serving the best food, just like we do. Verducci’s is a major reason why we will be returning to St. Pete Beach, sooner rather than later (and we are typically not vacation destination repeaters). Next time I will be trying one of their amazing looking pizzas and homemade gnocchi. Note: If you are traveling, eat here the first day of your trip. I have a feeling you’ll return. We did…three times! Thank goodness for Internet research. Carefree Kristin (#3) makes me happy. 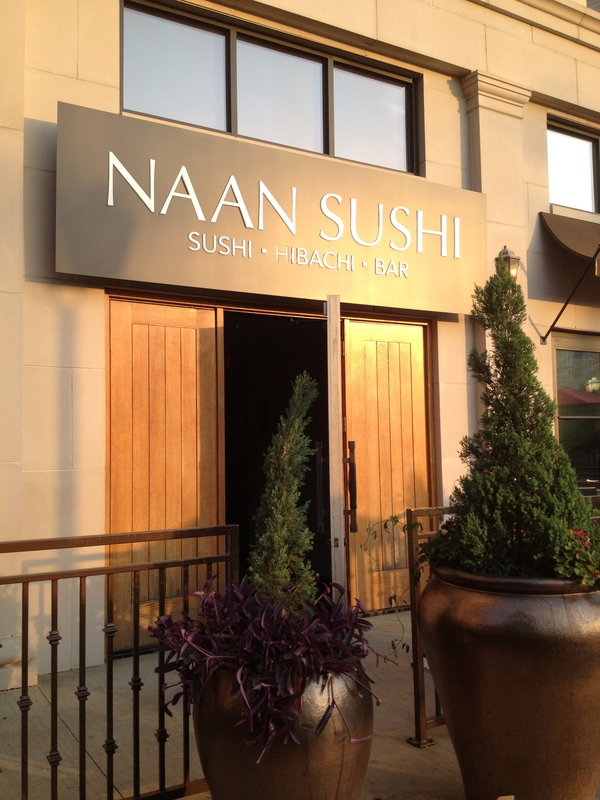 Naan Sushi is frequently on the DFW Groupon list. It’s located in Uptown in a trendy apartment area. Parking is limited and we parked a distance away at a meter; however, they do also have valet. Naan is no stranger to the Groupon, in fact, the server asked us if we had any coupons before we even placed our first drink order. Happy Hour (drinks and food) was coming to a close, but we still had time to order. 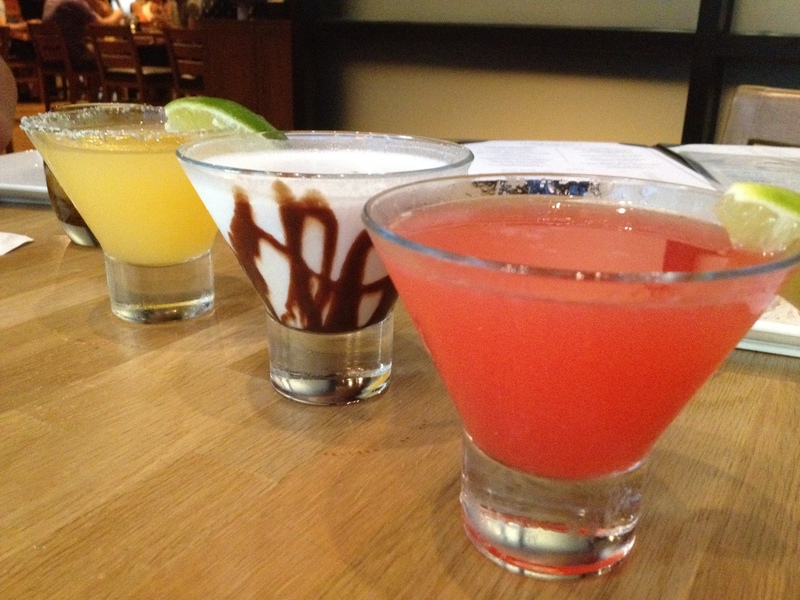 We ordered the Ruby Crush, White Chocolate, and Tex Mex martinis. Kristin and I ended up switching drinks because while she preferred the sweetness of the margarita-like martini, I enjoyed the Ruby Crush as it distinctly tasted more martini-like with a subtle sweetness. No one wanted the White Chocolate Martini. When Danny ordered it trying to be sweet and make sure I was able to taste all of the martinis on the happy hour menu, I couldn’t help but think to myself, “Don’t do it!”. Cool runny milkshake martinis are not something I enjoy. 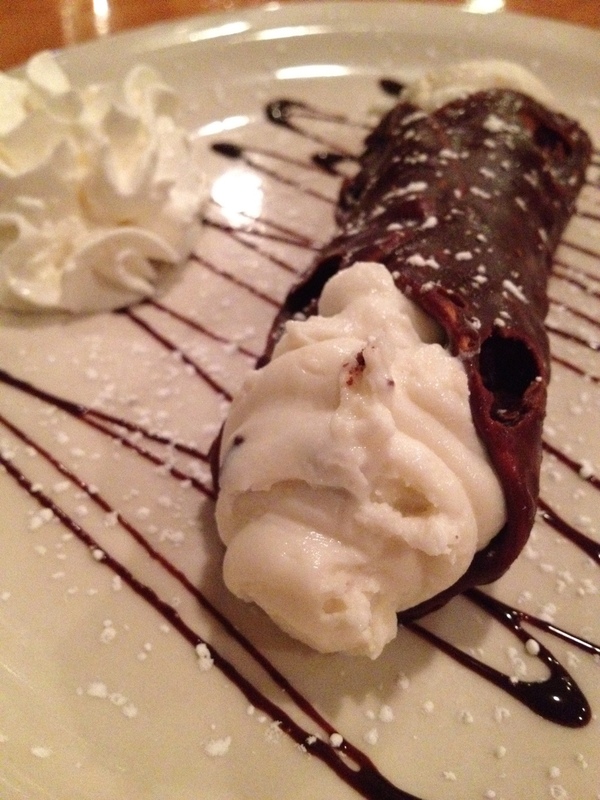 A frozen mudslide on the other hand in lieu of dessert….perhaps. One of the best items of the evening was the Ahi Tuna Tower. 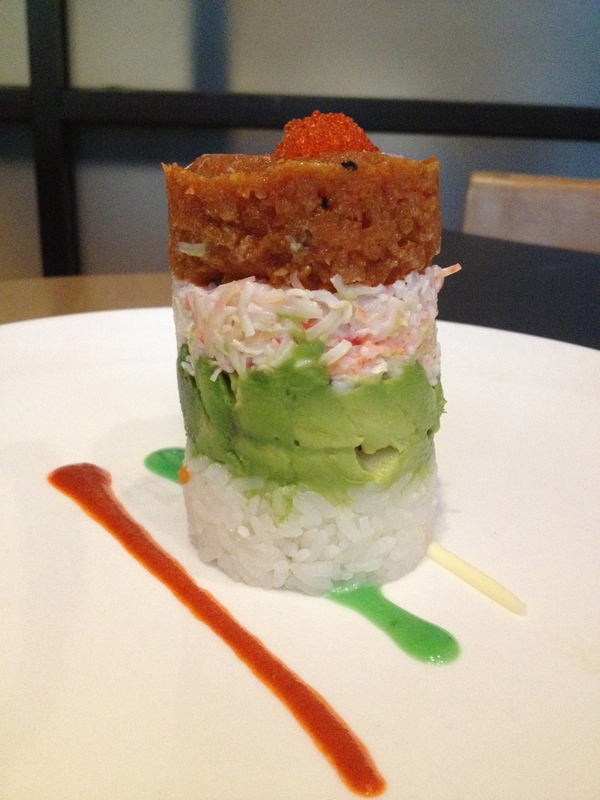 It is a layered in a cylinder shape and includes rice, avocado paste, crab, spicy tuna, Japanese mayo, sriracha, and wasabi. The initial presentation is quite lovely but then they mix it all together in front of you. Messy looking but SUPER SPICY GOOD! 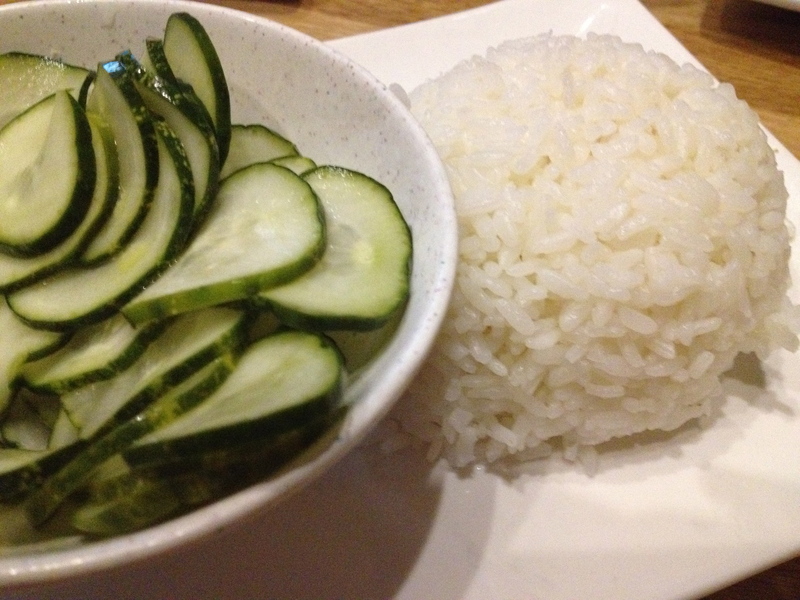 Not even a single piece of rice was left on the plate. I will be ordering this dish on every visit. 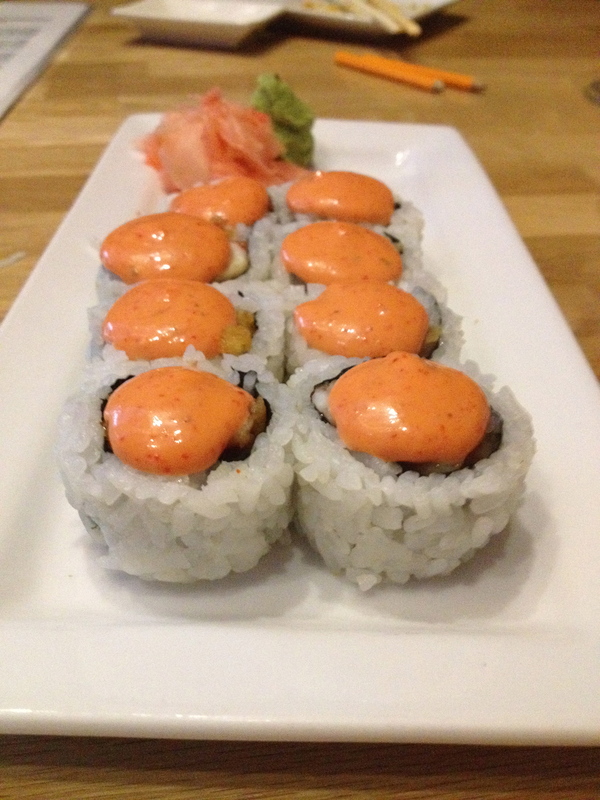 Next, we were up to try a couple of sushi rolls and this was no easy task because there was an extensive list. Danny picked the Louisiana Roll and Kristin and I settled on the Baylor Bear Roll. 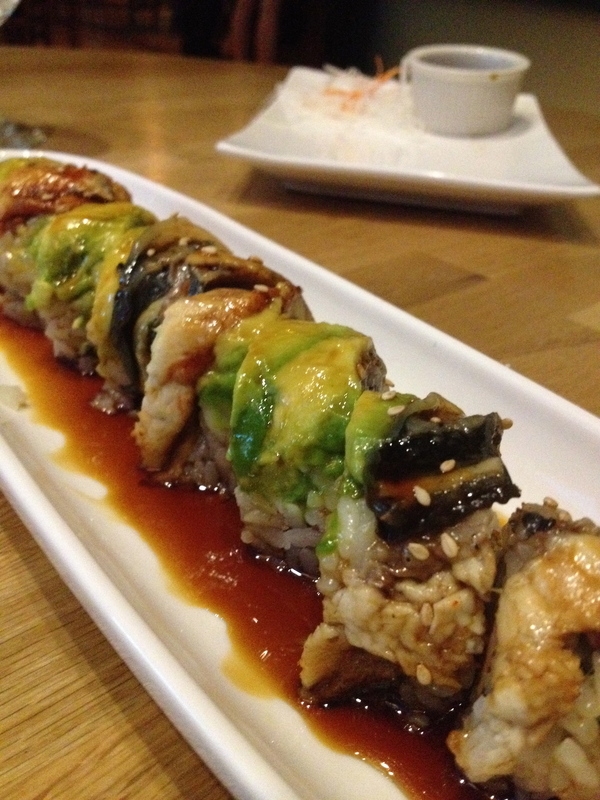 It was an obvious choice being that Baylor is both of our alma maters, not necessarily because we thought it would taste better than the Texas Tech Roll or the Texas A&M Roll. I think it would have been better had it not been swimming in sauce. 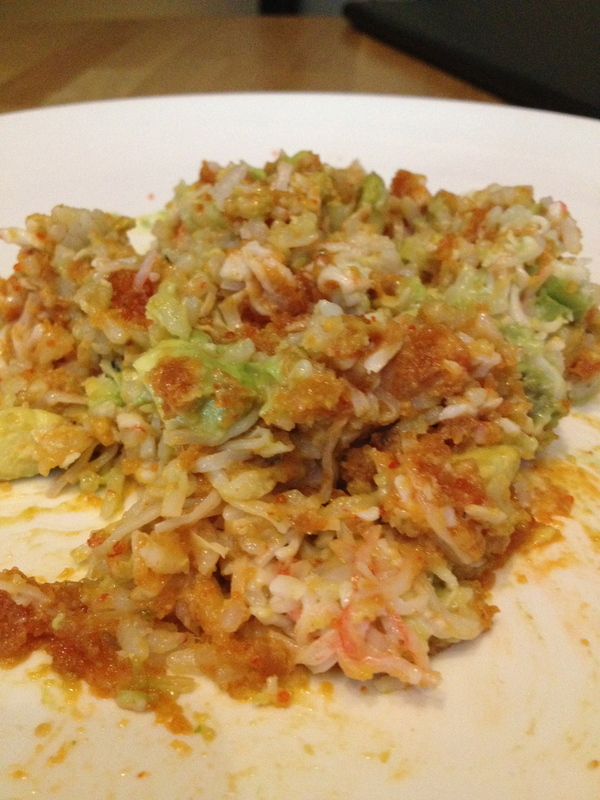 Danny won this round; the spicy sauce on top of the deep fried crawfish roll won us all over. 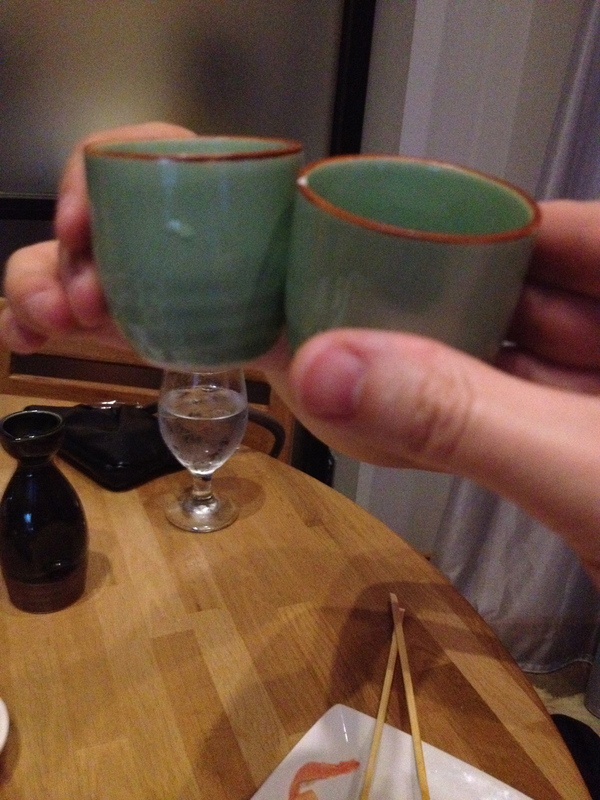 A little saki and it was on to our main courses. 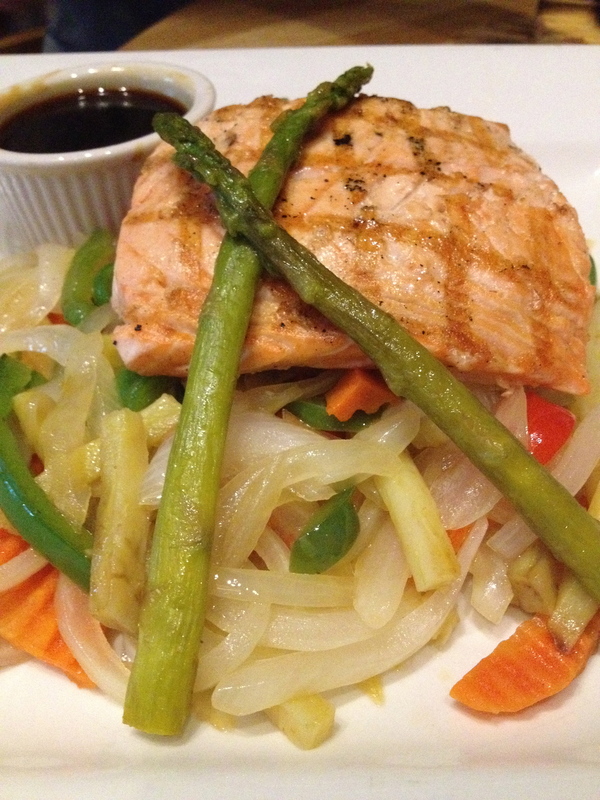 The Salmon Teriyaki was light and fresh and loaded with vegetables. 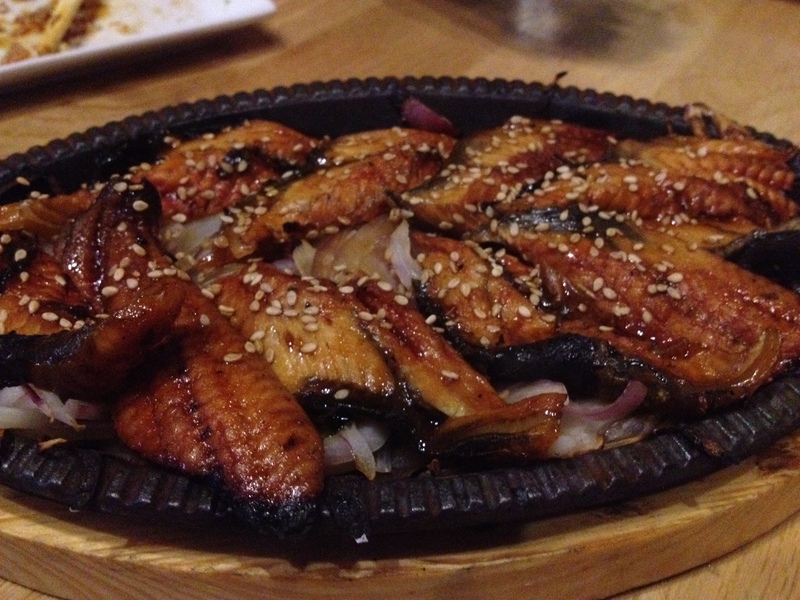 The Charbroiled Eel reminded me of sesame chicken, if chicken had a wiggly consistency. I don’t mind eating eel, I just wish it would not seem like I was devouring a squishy, worm-like creature. If the texture was more firm, like chicken….? No, I decided, I do not really want to eat eel if given a choice. There are just too many other things out there that I like better. After the $60 Groupon was applied, we ended up splitting a bill of about $60 (for 3 of us). Happy Hour items and alcohol did not count towards the Groupon (just FYI for all of you out there holding one of these coupons). Any time you can play with chop sticks and enjoy a multiple course meal, I’d say it’s a night well spent. 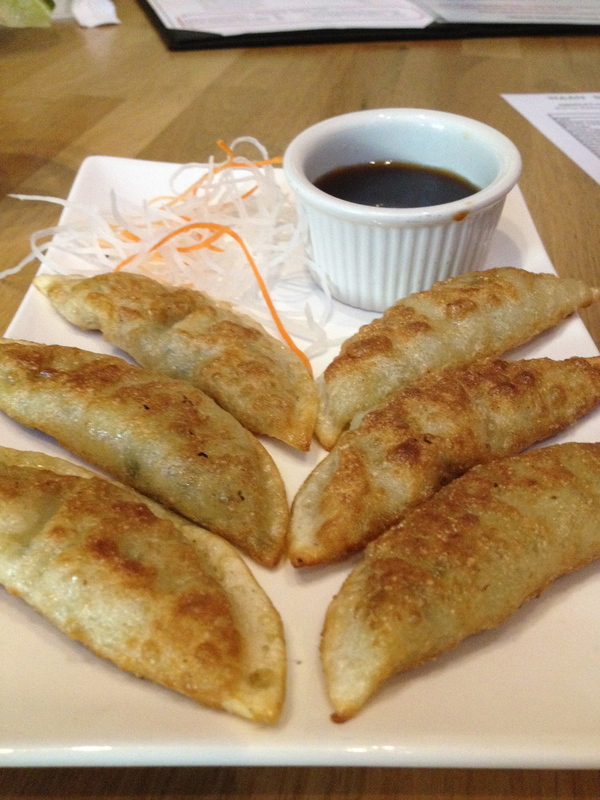 Naan Sushi is a great place to go on a date or just hang out with friends; it’s not too loud and good for conversation. 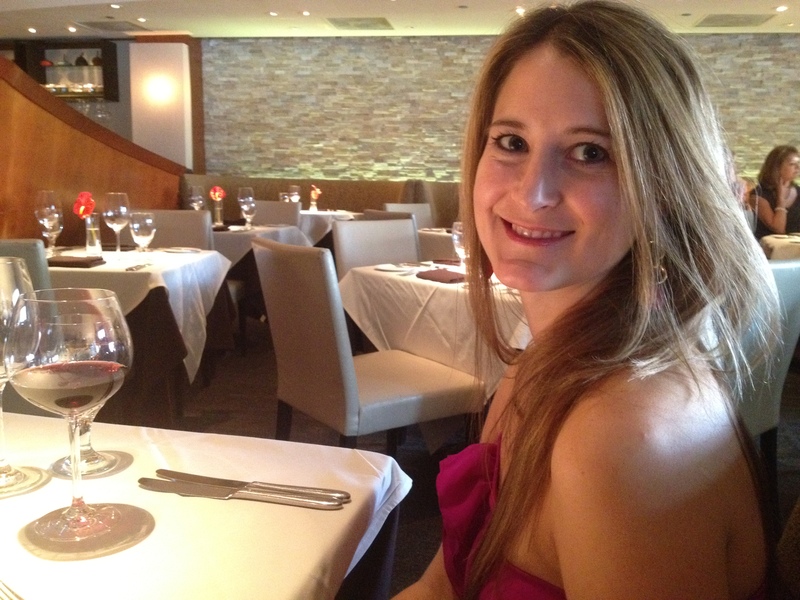 The decor adds an upscale touch and if you’re looking to surprise someone special, this place will do the trick. 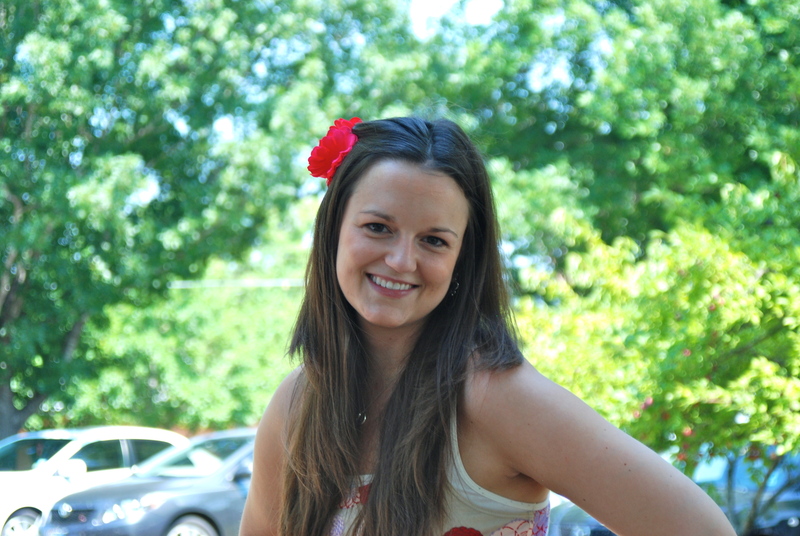 Congratulations on the new job, Kristin! I know we’ll have many more celebratory dinners in your future!